MiND will provide a comprehensive training programme for 15 Early Stage Researchers (ESRs) covering all aspects of innovative and state-of-the-art ADHD and ASD research. Training will be innovation-oriented and achieved through an international, interdisciplinary, and intersectoral approach that will combine research-specific skills, complementary skills and soft skills. The doctoral research will form the core of the doctoral programme and will provide trainees with a cutting-edge background in the science of neurodevelopmental disorders, as only through conducting original research, the major outcomes of a doctoral education – such as creative thinking, a flexible mind, scientific autonomy, innovation-mindedness and expertise in a certain field – can be reached. On top of this, it is MiND’s explicit goal to provide Early Stage Researchers (ESRs) with an international mindset, ease in intersectoral and interdisciplinary communication, and transferable skills that will promote their career. Taken together, the MiND training programme will allow them to foster collaborations by bridging the gaps between basic research, clinical studies and commercial enterprises, maximizing their future employability in academic as well as private sectors. To the 4 ‘i’ principle (innovation-oriented, intersectoral, international, interdisciplinary) of training, we are adding a fifth ‘i’ in MiND, by individualizing the training programme to the needs of the individual Early Stage Researchers (ESRs). This will be achieved through personalized career development plans. All ESRs will undertake interdisciplinary projects which will comprise a cooperative effort between network partners, including private and associated partners. All ESRs will perform original research at the cutting edge of science in the field of neurodevelopmental psychiatric disorders. All ESRs will receive training in academic and private sector-related research and skills through Research Training Courses, Complementary Skills Courses and Soft Skills Courses. ESRs will attend MiND Network Meetings that will bring together all academic and industrial partners and will include presentations of each WP and ESR project. All ESRs will undertake interdisciplinary secondments allowing them to gain new technological expertise and enhance mobility. All trainees appointed to an academic partner will spend time in the private sector and vice versa. Through this mobility they will profit optimally from local and network expertise. All ESRs will be exposed to international supervision, either through partners sharing primary supervision of individual ESR projects and/or through secondments. The MiND training programme combines training in hard skills (which comprise both scientific and complementary skills) and soft skills. A personal career development plan is defined for each trainee to benefit optimally from this programme. 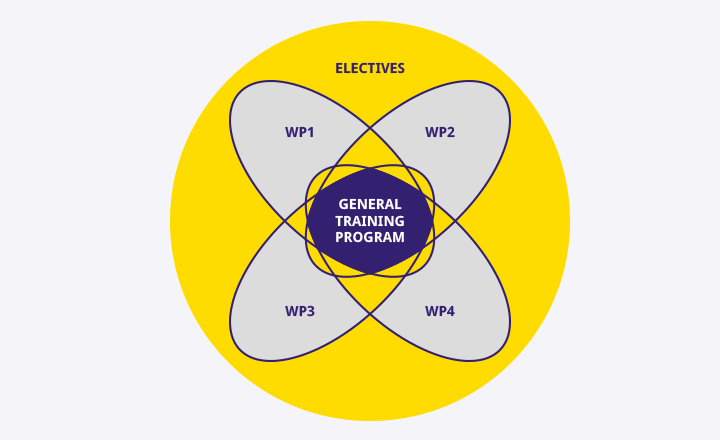 This plan includes three types of training: i) general training courses that are mandatory for all ESRs, ii) work package-specific training courses (including secondments) that are mandatory for all ESRs in a given work package, and iii) electives that contain training beyond the MiND training programme and are selected according to the individual needs of the respective ESR (see Figure). In accordance with the procedures in several of the graduate schools at the partner institutions, ESRs are expected to follow a total of at least 24 European Credit Transfer System points (1 European credit point (EC) = 28 study hours) in courses/workshops/e-learning modules over their training period. Training will be particularly dense in the first year after recruitment to give the ESRs a firm basis. The established Education and Career Development Board approves the career development plan and monitors the progress of the trainee at several checkpoints throughout the training.